The Ministry of Utmost Happiness (Penguin; 2017) is available at all leading bookstore across India, and can be purchased on Amazon here. No one can accuse Arundhati Roy of being a prolific literary writer. It took her twenty years to produce her second book of fiction The Ministry of Utmost Happiness (Penguin; 2017). To use Royspeak, it is possible to dislike this book Very Much. It is also possible to like this book Very Much. It is Everything. It is Nothing. It feels like Roy has strung together thematically (barely) cohesive short stories to produce a novel. At any rate, she has stitched together disparate sub-plots to produce this omnibus. Mid-way through the book, the main character Anjum, an unapologetic, Old Delhi Muslim hijra (transgendered man) who likes to make an appearance in high heels, bright lipstick and garish salwar suits, falls through a rabbit hole and disappears altogether for several chapters. 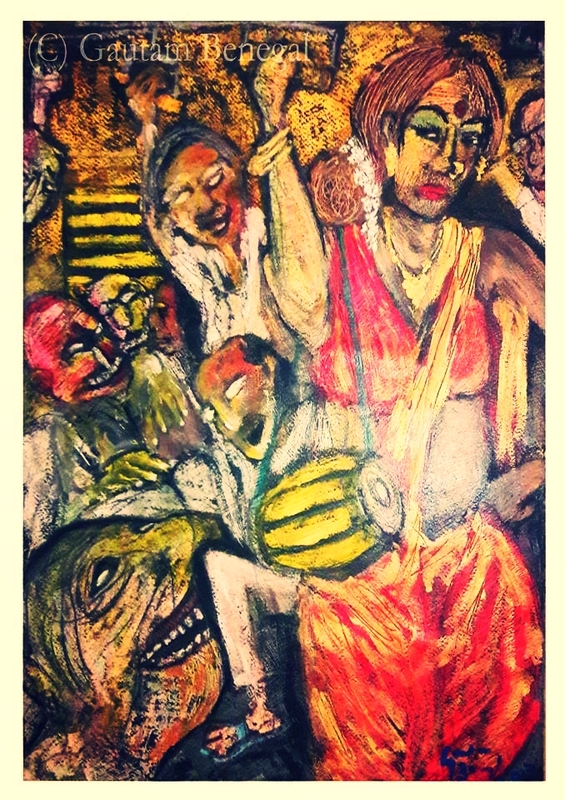 Art work entitled 'Hijra' by Gautam Benegal. In her place, appears the South Indian Syrian Christian Tilottama (Tilo), who it must be said, bears a striking resemblance to Roy, ‘her long, thick hair was neither straight nor curly, but tangled and uncared for. I could imagine small birds nesting in it.’ In fact the desultory nature of Tilo’s life, a tenant in a Delhi barsati, and its sporadic freefall into precarious penury, runs parallel to Roy’s own early adventures of living on the fringes. There is the long-suffering 'Garson Hobart' who she meets while at the 'Architecture School'. He begins telling Tilo’s story in first person but somewhere along the line, Tilo’s story is told in third person. One can’t help wondering if Garson - whose unrequited passion for Tilo is only resolved by Tilo disappearing from his life - is (at least in part) Gerard da Cunha. Roy had met Cunha while at architecture college, and subsequently had a relationship with him. There is Naga the compromised journalist who Tilo eventually marries. He bears an uncanny resemblance to the overbearing and recently discredited Arnab Goswami of the ‘Nation wants to know' fame. But Tilo’s heart belongs to Musa Yeswi the Kashmiri militant. In any event, it is difficult to care for either Anjum or Tilottama because their lives never truly unfold. They are like props in a play where the attention is focussed elsewhere. When at last, towards the tail-end of the book, we discover that, Tilo and Musa ‘had always fitted together like pieces of an unsolved and (perhaps unsolvable) puzzle,' we don’t really care. Nor do we really mourn as we hurtle towards some sort of ending where the reader is confronted with the inevitability of Musa’s death. What unfolds page after page is Roy’s own politics; her own views on the current political landscape of India. No topic is spared, from the larger issues of the ever growing presence of Hindutva, the grave miscarriage of justice in Kashmir, the skewed reportage by ‘bought’ journalists, atrocities committed against Dalits, the indignity of transgendered lives, the death of cities caused by their consumption of environmental resources, ‘Like cities. Fizzy, effervescent, simulating the illusion of life while the planet they had plundered died around them,’ to minor asides about scientific experiments carried out on animals. Random stories which read like case histories sprawl on pages totally unrelated to the overall narrative. No attempt to coherently edit out the egregious excesses of self-indulgent writing has been made. The generosity of allowing Roy a free editorial hand has resulted in a book which fails to elicit the reader's sympathy for any one cause. And yet at the same time, this is a book of immense importance. At a time when journalists and rationalists are killed with impunity in India for speaking against the establishment, Roy shows tremendous courage. The musicality of her earlier work has all but dissipated but why shouldn’t it have? She is 20 years older. Just as the artist Henri de Toulouse-Lautrec was dubbed the ‘chronicler of Paris’, Roy can rightfully claim the title of ‘chronicler of India’ and like Lautrec who was determined to capture Paris in all its louche, sordid squalor, so too is Roy. She wants to start the process whereby we see minorities - sexual, ethnic, religious - not as ‘the other’ but as fellow citizens. Muslims are not anti-nationalists. They are neighbours, people with their own individual histories. Kashmiris are not a foreign policy ‘problem’ to be dealt with. They are a people with aspirations of their own. We cannot continue dehumanising entire segments of humanity because we perceive them to be the ‘enemy’. Who else but Roy, can perhaps escape sanction and censure when she refers to prime-minister Narendra Modi as ‘Gujurat ka Lalla’, or the RSS as an ‘Organization’, Orwellian in its desire to revise history and shape India’s destiny with its own blinkered vision, or the almost-infinite internet trolls set loose on social media and other self-appointed vigilantes of the Hindu Rastra who roam the streets, an army of ‘saffron parakeets’? She has her finger on the political pulse of India. Nothing escapes her scrutiny. And anyone with a conscience, deep down, will know that Roy speaks the truth. This bird-like creature in whose hair indeed birds can nest and shelter, is deeply committed to her activism and bears the courage of her convictions. She is India’s conscious. This is a book India must pay heed to.